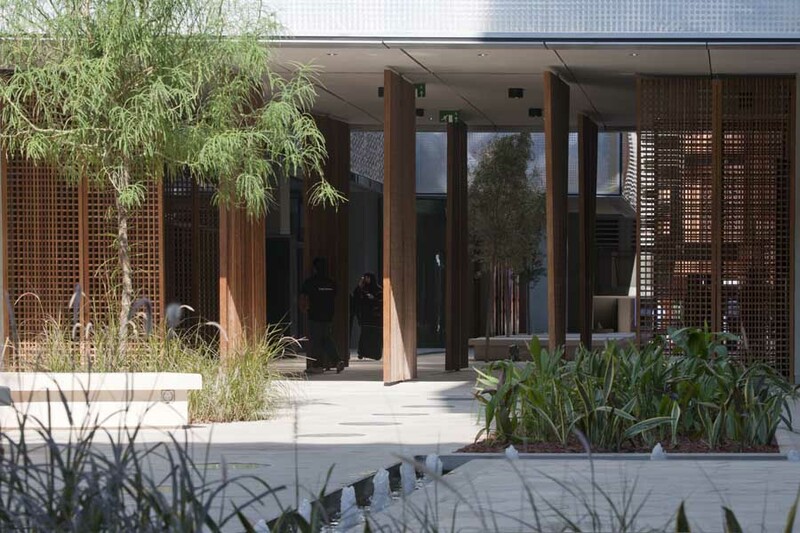 Under the patronage of His Highness Sheikh Mohammed bin Zayed Al Nahyan, Crown Prince of Abu Dhabi and Deputy Supreme Commander of the UAE Armed Forces, His Highness Sheikh Mansour bin Zayed Al Nahyan, Deputy Prime Minister and Minister of Presidential Affairs officially inaugurated the Masdar Institute today, at which the architect Lord Foster was present. 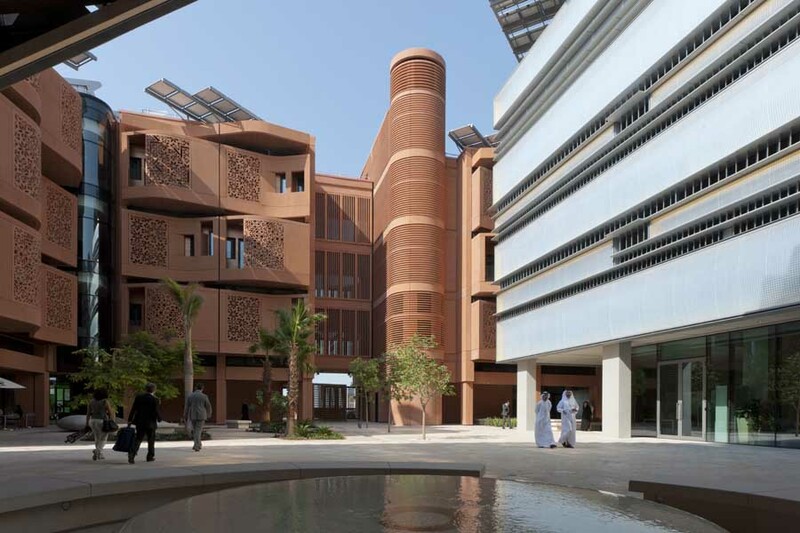 The Masdar Institute, devoted to researching sustainability, is the first building to be fully operational within Masdar City. 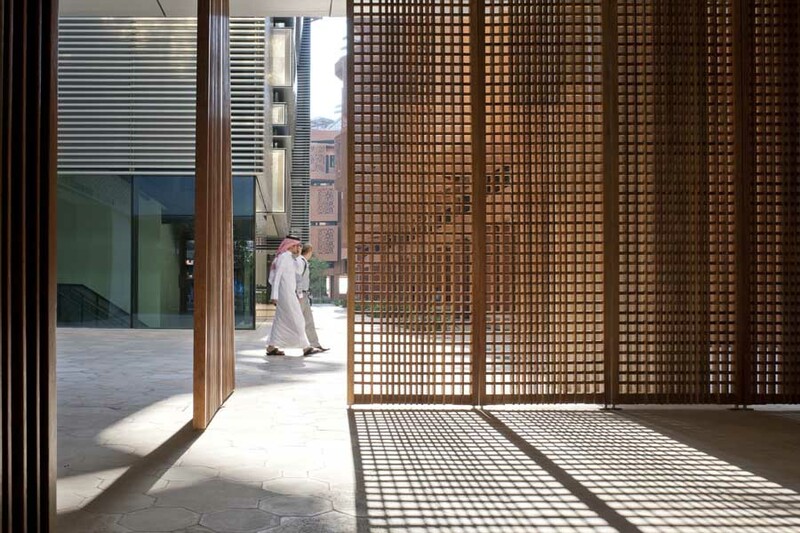 The masterplan, by Foster + Partners, incorporates lessons which have evolved over centuries of traditional Arabian architecture. A 10 megawatt solar field within the masterplan site provides 60% more energy than is consumed by the Masdar Institute, the remaining energy is fed back to the Abu Dhabi grid. 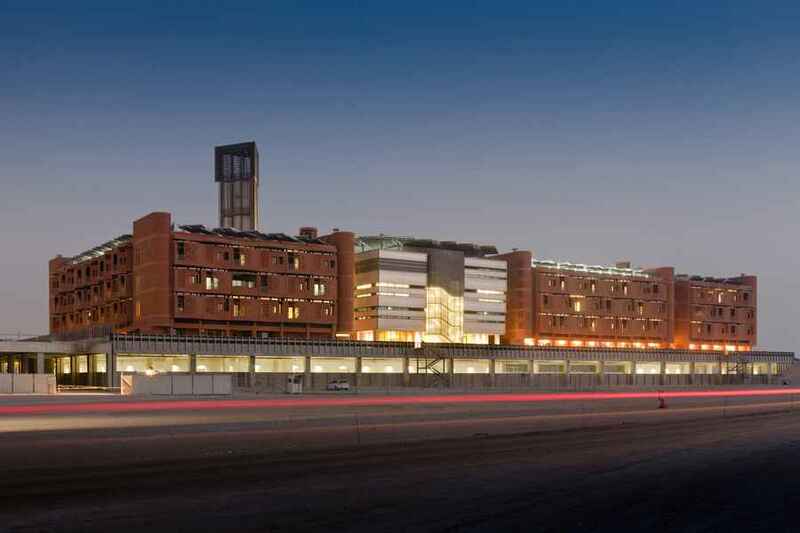 The campus, which consists of a main building, a knowledge centre and students’ quarters, will use significantly less energy and water than average buildings in the UAE. In particular, the Institute and its facilities use 54 percent less potable water, 51 percent less electricity and are fully powered by solar energy. These reductions are based on comparisons to UAE standard baselines for buildings of similar size and specifications. Around 30 percent of the campus’s energy will be covered by solar panels on the roof, with 75 percent of hot water also being heated by the sun. 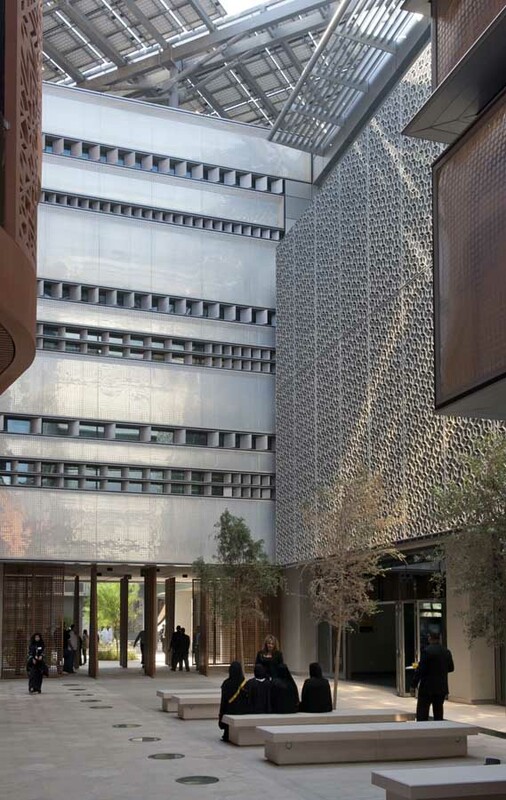 The Institute demonstrates the sustainable principles underpinning the overall masterplan. 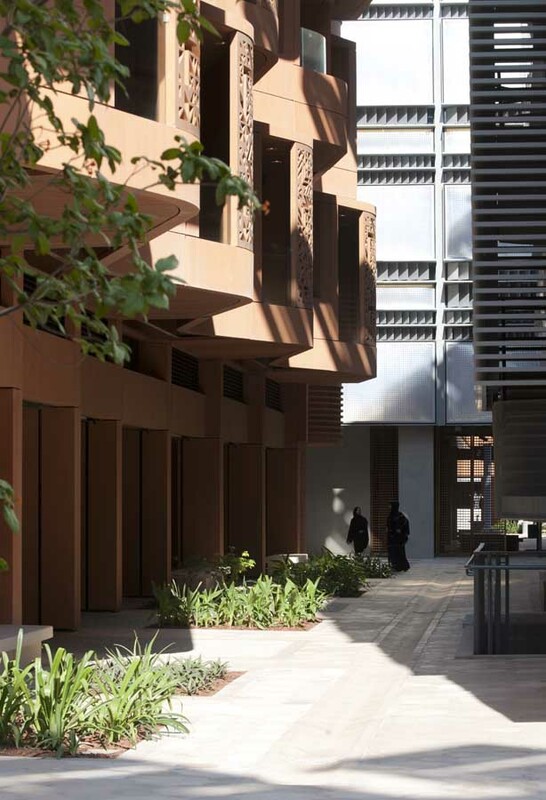 The buildings have self-shading facades and are orientated to provide maximum shade as well as sheltering adjacent buildings and the pedestrian streets below. 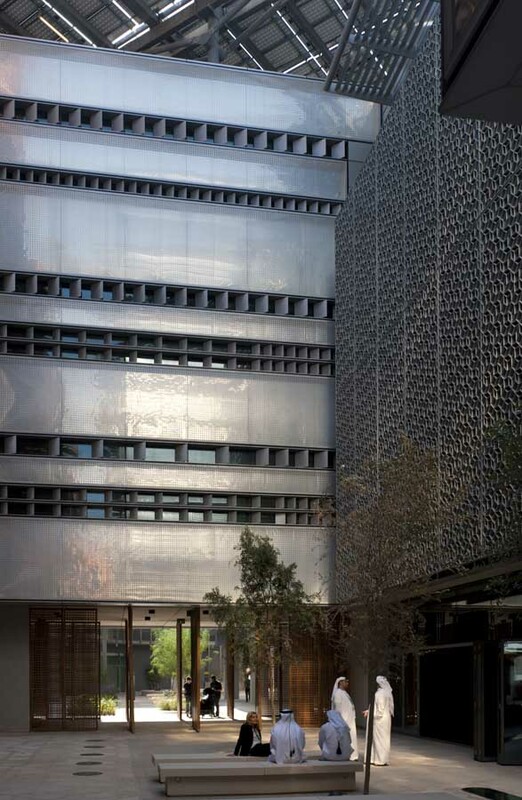 Over 5,000 square metres of roof mounted photovoltaic installations provide power and additional shading at street level. 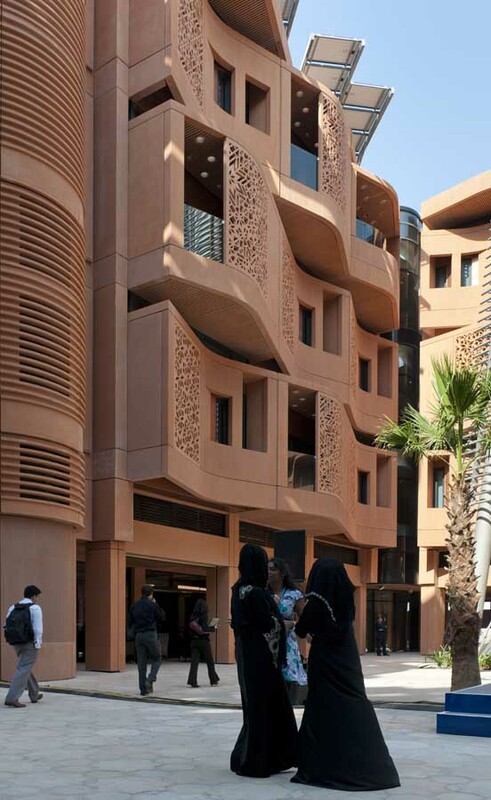 Windows in the residential buildings are protected by a contemporary reinterpretation of mashrabiya, a type of latticed projecting oriel window, constructed with sustainably developed, glass-reinforced concrete, coloured with local sand to integrate with its desert context and to minimise maintenance. 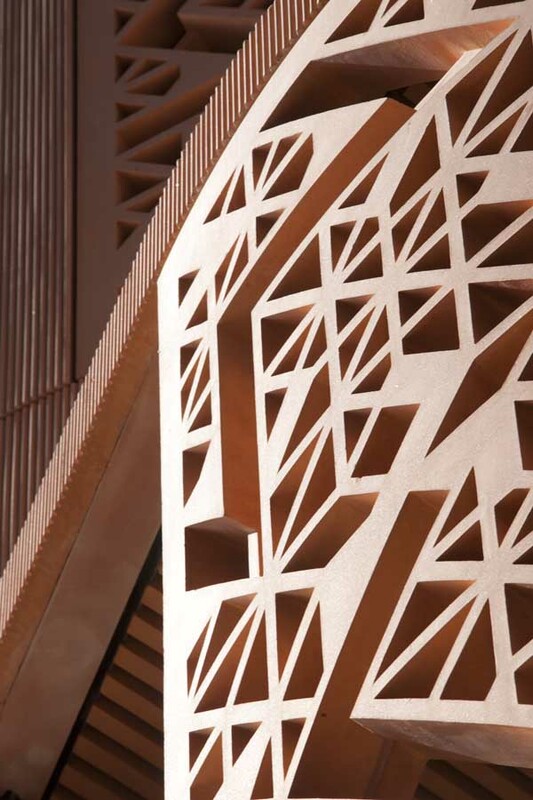 The perforations for light and shade are based on the patterns found in the traditional architecture of Islam. The laboratories are unusually flexible for change with ‘plug and play’ services to encourage interdisciplinary research. 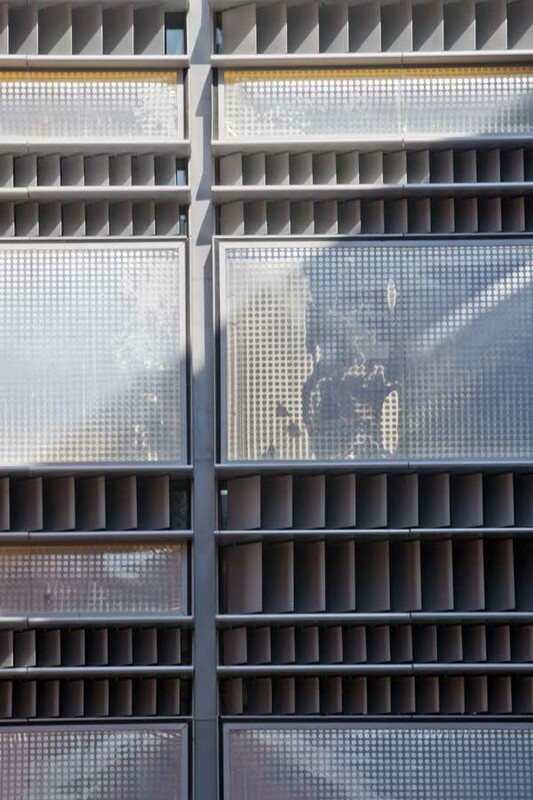 Horizontal and vertical fins and brise soleil shade the laboratories. These are highly insulated by facades of inflatable cushions, which remain cool to the touch under the most intense desert sun. Cooling air currents are channelled through the public spaces using a contemporary interpretation of the region’s traditional windtowers. 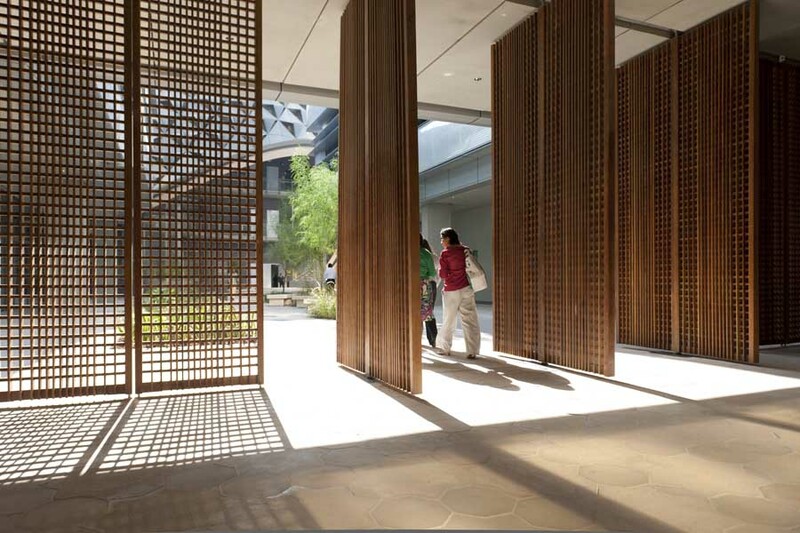 The public spaces are further cooled by green landscaping and water to provide evaporative cooling. 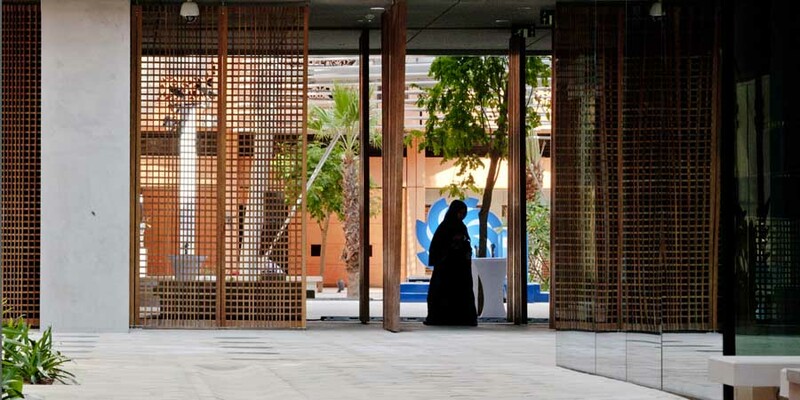 Thermal camera tests on-site by Fosters’ research team have already confirmed substantial drops in radiant or ‘felt’ temperatures on campus compared with current practice in central Abu Dhabi. 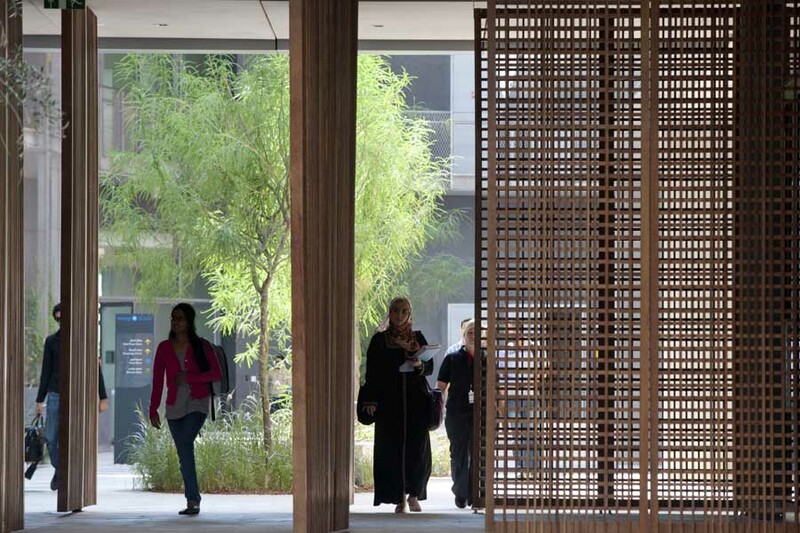 The laboratories and residential accommodation are supported by a variety of social spaces, including a gymnasium, canteen, café, knowledge centre, majlis – or meeting place – and landscaped areas that extend the civic realm and help to create a new destination within the city. One, two and three-bedroom apartments are housed in low-rise, high-density blocks, which act as a social counterpoint to the educational laboratory environment. This building is the first of four planned phases that will bring the eventual student population to 600-800. Four residential blocks surround a central laboratory and the Knowledge Centre, the first in a series of additional campus buildings, which will include a mosque, conference hall and sports complex. The second phase is due to start on site by the end of the year to include further laboratories and apartments. 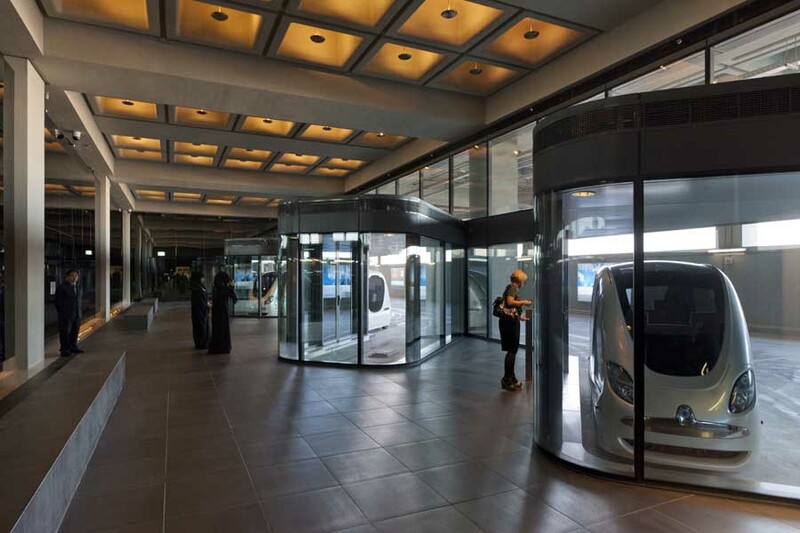 The Masdar Institute is accessed by 10 personal rapid transit (PRT) cars that are being run as a pilot project from the City perimeter to the undercroft below the building. 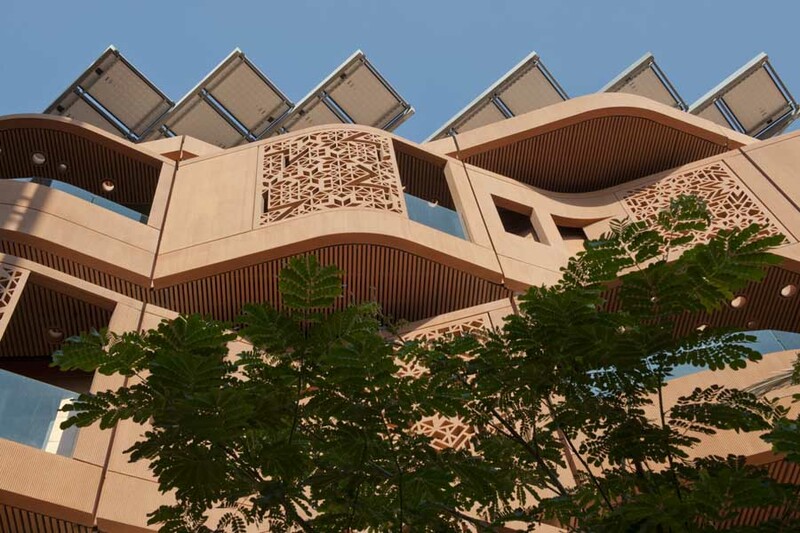 This project signals Abu Dhabi’s commitment to creating an international centre to pioneer sustainable technologies within an environment which is itself carbon neutral. Lord Foster, said: “Many have dreamed of a utopian project that would be solar powered. Today’s official opening of the initial stage of the Masdar Institute campus at Masdar City is a first realisation of that quest. Its student community is already active, living and working in their quarters. 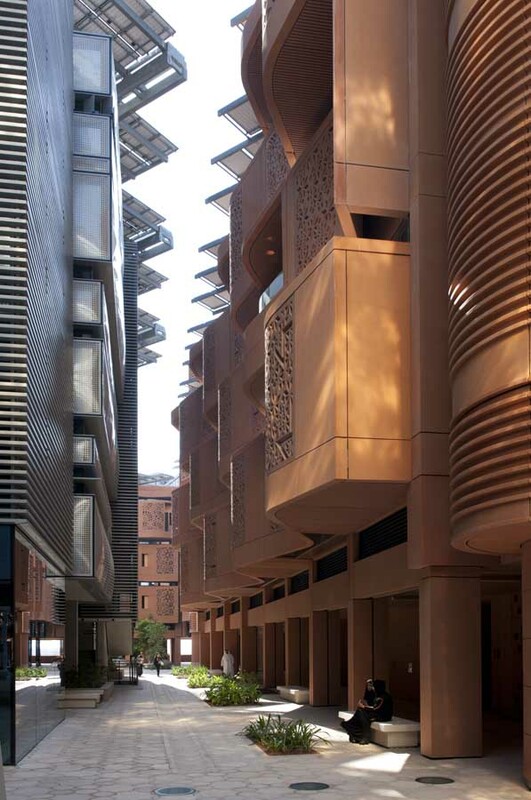 The Masdar Institute’s graduate-level programmes were established and accredited in collaboration with the Massachusetts Institute of Technology (MIT) in Boston and focus on scientific engineering and research in the core energy and sustainable technologies of the Masdar Initiative. The buildings are oriented to provide optimum shade and reduce cooling loads and shaded colonnades at podium level bring benefits through high insulation and exposed thermal mass. Transitional thermal spaces are also integrated – these mediate between internal and external zones and are conditioned primarily by buoyancy-driven natural ventilation and the effects of thermal mass.